The Shorty Buzzer is very good when used as the point of a team. Tag : Fire orange UTC 140 thread. Rib : Black thread and fire orange thread twisted together. Thorax : Black thread built into a lump with cheeks of either luminous yarn or crisp packet material. Both threads must be on bobbin holders. 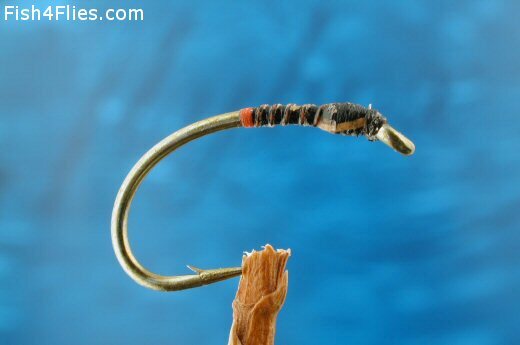 Form a small lump of fire orange thread opposite the point of the hook. Leave the tag end of this thread in place. Start the black thread in the thorax area and tie down the tail end of the fire orange thread. Work towards the fire orange thread lump in neat touching turns with no gaps. On reaching the fire orange lump twist the two threads together and rib back down to the thorax area. Using the black thread tie off the fire orange thread and trim it out. Tie in the cheek material and form the thorax from the black thread. With the thread behind the hook eye pull the cheeks forward and tie down. Whip finish and varnish the whole fly. Currently there are no comments about the Shorty Buzzer fly pattern from other fly fishermen yet.